It’s hard for spouses of recruits to find jobs in Maine. A new program hopes to change that. Michelle Hale (left) and Aubrae Filipiak are the Dual Career Network project leader and director of Maine Career Connect, respectively. The Dual Career Network is a new program that hopes to help Bangor businesses recruit and retain talent. As many as 44 percent of faculty members at the University of Maine considered leaving the school in order to improve their spouse or partner’s career opportunities, according to a study dating back to 2009. Hiring and retaining employees is a problem not only for the university but also for other Maine businesses, according to Michelle Hale, senior human relations partner at the University of Maine and project leader with the Dual Career Network. The 2009 UMaine study was included in a grant request written by school researchers to the National Science Foundation to help fund studies related to faculty departure. In 2013 a supplemental grant helped create Maine Career Connect, a nonprofit that works with businesses to ease the transition into Maine for out-of-state hires, according to their website. That’s why Maine Career Connect decided to start the Dual Career Network, which educates small- and medium-sized businesses about how to attract and keep talent, as well as how to support families through their move to Maine. 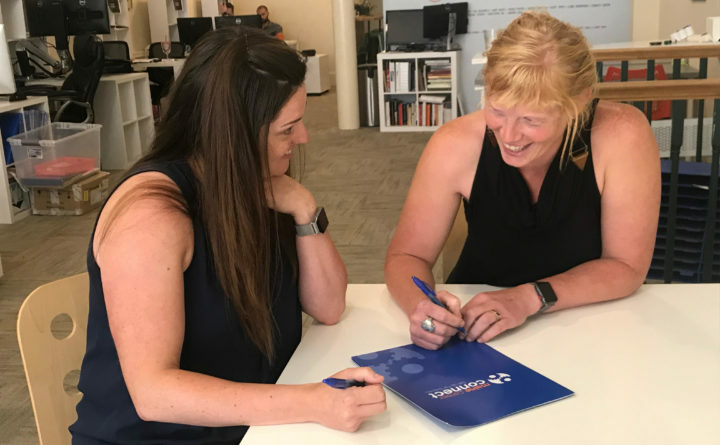 Beginning July 18, Maine Career Connect will host monthly workshops targeted at such businesses at the Bangor Chamber of Commerce, with the hope of achieving those goals. There is no cost for attending the meeting or joining the network. Filipiak said that although Maine Career Connect already has programs for sale that focus on connecting partners and spouses to potential employers, as well as helping families adjust, as a non-profit they want to give back to the Bangor community with the Dual Career Network. “We’re doing a brown-bag lunch style,” Hale said. She said the first 20 minutes of the meeting will be a workshop focused on workforce development presented by both Maine Career Connect and outside experts, followed by a guided networking session. The last part of the meeting will be open for “guided networking”, according to Hale and Filipiak. Participants will have time to discuss what they learned during the workshop, as well as positions they may be looking to fill. The first meeting will be presented by Maine Career Connect and will focus on the Partner Accommodation program, according to Hale. MCC will educate employers on how the program can be put to use in their own business, as well as sharing examples of policies and program design, Hale said. Following meetings will be determined by what the members want to learn. Hale said that they will work with members to find topics that are valuable to them, and then bring in experts to address the topics. Additionally, Filipiak and Hale said that there will be an update coming to the Maine Career Connect website later in the summer. The update will include a password-protected job board, which will have curated resumes of recently relocated partners looking for jobs. Companies with a password can then access the site and use the resumes as a resource for finding new talent. Ultimately, Filipiak said the program’s goals are to bring more talent to the Bangor area, to help local employers recruit new employees and to convince the employees who are here to stay in the area. “We’re really invested in the success of Bangor on an economic level, on a workforce level, on a cultural level … Our program is heavily invested in showcasing all the Bangor area has to offer,” Filipiak said. The first meeting for the Dual Career Network is set for 11:45 a.m. on Wednesday, July 18, at the Bangor Region Chamber of Commerce. Subsequent meetings will be held on the third Wednesday each month. RSVP to michelle.hale@maine.edu.